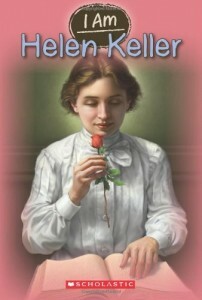 I am Helen Keller by Grace Norwich is a fun, yet informative look into the life of Helen Keller. The language, font size, and layout of text accompanied by illustrations on nearly every page make this book completely accessible to readers at the fourth to fifth grade reading level and up. Because I am Helen Keller is written from a kid-like first person point-of-view and voice, readers are planted in Helen Keller’s shoes and drawn into learning why Helen Keller continues to be one of the most famous children throughout the world. Norwich has done a superb job of researching Helen Keller’s life and pairing down both the key facts, as well as those that would most appeal to fourth and fifth grade readers. She has also organized and streamlined the information such that it is pleasing to the eye and easy to read. Norwich begins with an introduction of the important people in Helen Keller’s life through a graphic portrait and succinct bio of each person. She continues with a timeline of relevant events to ground readers in time and place. In fourteen short chapters Norwich covers Helen’s life from birth to death and complements her text with great visuals to keep readers engaged. Norwich sums up with a list of ten things you should know about Helen Keller and a second list of ten more things that are pretty cool to know about her. Kids, parents, and teachers will also find a useful glossary of words related to Helen Keller, as well as a list of places to visit, a bibliography, and an index to easily refer back to areas of interest. I am Helen Keller is a new title in the I am Series and joins other interesting titles such as: I am Sacagawea, I am Albert Einstein, I am Martin Luther King, Jr., I am George Washington, and I am Harriet Tubman. Every fourth and fifth grade reading list should include books from the I am Series. I cannot think of a better source of biographies that would make learning about key historical figures more entertaining. All these years I never knew the colonists who dumped the tea into the harbor dressed as “Mohawks” to disguise themselves during their late-night escapades! How did I make it through all those years in school without learning this fascinating fact? Peter Malone’s illustrations are detailed and bring history alive, while Russell Freedman weaves together some of the most relevant and interesting facts of the historic Boston Tea Party. Freedman seamlessly pulls together first-hand resources without overwhelming students in the primary grades with too much information. The Boston Tea Party is a good read aloud, and it would be an obvious pick for a unit about the American Revolution for a fourth grade or fifth grade class. 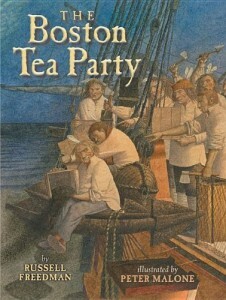 It would also be a good book to read in mid-December, since the Boston Tea Party took place on December 16, 1773. Students should be encouraged to write down words while they read this book that they need to look up and to record the definitions. Also, after reading this book, students could write a quick journal entry about what they would do if they had been in the streets the night they saw “Mohawks” going quietly to the harbor in Boston the night of the Boston Tea Party. At the end of this book, there are several great resources for further information, including a map from the eighteenth century, insights into why tea was so culturally relevant (and why it caused such a commotion! ), and a time line of the events leading up to the Revolutionary War. As a follow-up activity, students should be encouraged to create either a diorama or a poster about the events of The Boston Tea Party. An older class could create a Bostonian newspaper – complete with ads, letters to the editor, comics, and editorials – set on December 17, 1773. Working on compiling a newspaper as a class encourages comprehension and research skills for every person in the class. The Boston Tea Party is an attention-grabbing children’s non-fiction book, and demonstrates clearly how intriguing our history really can be to any reader. Do you know a student who really wants to be a marine biologist? Make a Splash is the perfect book for him/her! This book is loaded with information about one of our planet’s most important resource: water. World-renowned ocean explorer Captain Jaques-Yves Cousteau’s grandson, Phillipe, teamed up with Cathryn Berger Kaye to show the majesty of water, but also how abused it is. The photography in this book makes it a great book to flip through for a casual read, but the captions and text are incredibly informative. The authors have given visual cues to indicate what kind of information is on each page: whether a definition in a caption bubble, fluid fact and figures, or information about how critical it is for each person to play a part in protecting water. Also, sprinkled throughout this book are anecdotes about students who researched various aspects of protecting water and its inhabitants. It is up to the individual reader to choose how to use this book; it is not meant to be read aloud from front to back, but a teacher could certainly read excerpts aloud during a unit on water. Though this book is on a fourth or fifth grade reading level, if taken from cover to cover, the ideas within this book are for any aged learner. It should be used to inspire readers about how they can make a difference in this planet’s care, no matter how young. There are simple ideas about how even first grade students can be water-wise by using reusable water bottles. It would be excellent for an elementary with a buddy system between first graders and fifth graders to take an idea and implement a plan to encourage water protection within the walls of the school or beyond! Before starting a unit on water conservation, students should watch the YouTube video of Cathryn Berger Kaye and Philippe Cousteau http://youtu.be/jhDhSL2ZeDg. Their excitement is contagious and can inspire students to make great changes! 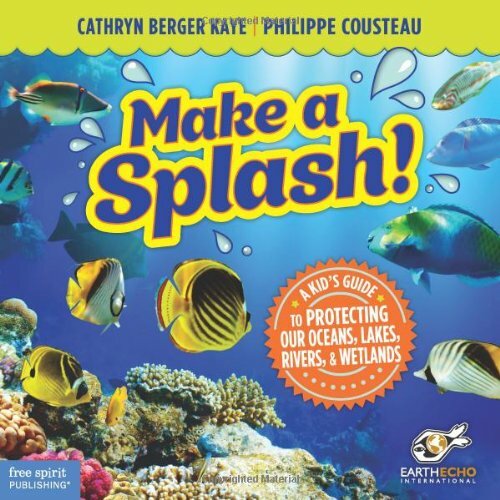 Make a Splash is an excellent book to include in a class or home library as a resource for any learner. Sometimes to inspire great change, it just takes making students aware, and Make a Splash certainly inspires students to be difference makers!